Opera aficionados, arts enthusiasts and eager visitors will come together in Sydney when Handa Opera on Sydney Harbour’s world-class production of Turandot opens on Thursday 24 March. NSW Minister for Trade, Tourism and Major Events, Stuart Ayres said Handa Opera on Sydney Harbour has introduced a new legion of fans to opera. “Handa Opera on Sydney Harbour is an incredible event and one that the NSW Government is proud to have helped establish. Our tourism and major events agency Destination NSW, partnered with Opera Australia in 2012 to bring this concept to fruition and it has grown to become a remarkable success, attracting over 37,000 visitors from overseas, interstate and intrastate to Sydney between 2012-2015 to enjoy this spectacular event,” Mr Ayres said. Handa on Sydney Harbour’s production reimagines Puccini’s exotic fantasy about a brutal princess and the brave suitor who will make any sacrifice to win her love. The cast features 12 principals, 18 dancers and 48 chorus members on stage with bold and dramatic costuming by designer Dan Potra. 223 speakers will carry the music out into the open night air, with 58 members of the Australian Opera and Ballet Orchestra playing in a custom-built studio under the stage. 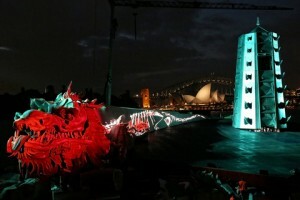 The soaring notes of the world’s most famous aria, Nessun Dorma, will ring out over the waters of Sydney Harbour from a custom-built floating stage that features a giant nine metre high and 60 metre long dragon, representing the Great Wall of China, and an 18 metre high illuminated pagoda. Destination NSW CEO, Sandra Chipchase, urges visitors to plan their trip to Sydney to see this iconic opera in an iconic city. “Turandot is a breath-taking delight to the senses. The production is a perfect opportunity for newcomers to opera to experience the spectacle. Those who already know and love Turandot will be impressed with this inspired production directed by Chen Shi-Zheng with a set and costumes that reflect the spirit of today’s China. For visitors to Sydney, Turandot showcases the best of the city – world-class opera, harbourside dining and spectacular sunsets over the city’s famous icons, the Opera House and Harbour Bridge,” said Ms Chipchase. Turandot runs for a four week season from 24 March to 24 April 2016 and travel packages for Handa Opera on Sydney Harbour can be booked through Qantas Holidays starting from $439 per person for two nights’ accommodation and event tickets, and Virgin Australia Holidays from $557 per person for two nights’ accommodation, return airfares and event tickets.